We share a lot of photos online on social media platforms these days; sometimes not even realizing that the data we’re sharing can be a potential threat to our privacy! Whenever we snap a photo using a smartphone or a digital camera, it captures more than just the photo. It includes details like the location where the particular photo was shot, the camera lens details, the ISO and aperture settings used, and may other details, all embedded in the file as metadata. While such details may not mean a lot to the average user, they provide a lot of insight about the photo, and the person who captured it. Professional photographers usually don’t want to reveal specific details about the camera settings and equipment used to capture a particular shot. Some users may not want to share the location (GeoTag) where a particular photo had been taken. The metadata embedded in photos captured by digital cameras and smartphones (called EXIF metadata), holds all this information. Many social media platforms, like WhatsApp, Facebook, Twitter and Imgur, do remove EXIF information automatically while uploading photos, so that other users don’t have access to the data. However, some people have pointed out that Facebook might be storing metadata information in their servers for advertising purposes, before discarding them. But many platforms, such as Flickr Dropbox, Picasa, etc., keep the metadata intact in the uploaded photos. The best way to ensure that EXIF data is not shared on social media platforms, along with the actual photos, is to remove them explicitly before sharing. 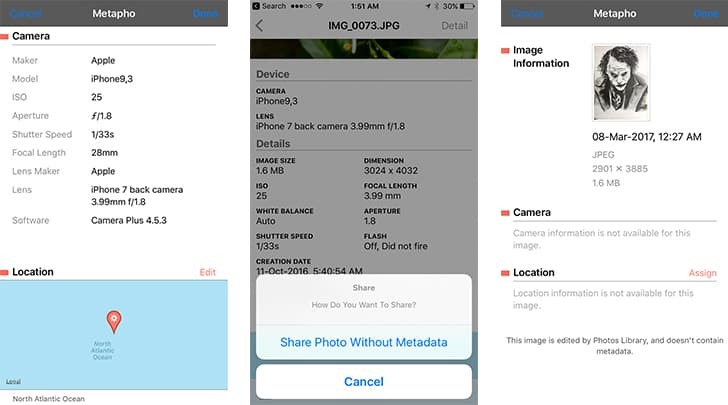 In this article, we’ll explore various apps that allow you to remove metadata like EXIF, location info, etc. from photos on Mac, Windows, iOS and Android platforms. You may remove metadata from images on Mac using a free software known as ImageOptim. ImageOptim is basically an image compression tool, which is used to reduce the size of images without losing quality. As a part of its image compression Preferences, you can choose to remove all metadata embedded within images. Removing such data from images is as easy as dragging and dropping images into ImageOptim’s application window or even on its Dock icon. Batch processing of images is also supported. ImageOptim is an open source tool, and can be downloaded for free from its official website. It is ideal for publishing and sharing images on the web, without giving away additional details in EXIF metadata. On Windows, a small application known as FileOptimizer helps to reduce the file size of various types of files, including popular image formats like JPEG or PNG, For image files, the application has the option to remove EXIF data. FileOptimizer is also an open source program, and may be downloaded from its official webpage. If you use any Linux distro, Trimage Image Compressor is a decent tool for stripping off EXIF metadata from images. Inspired by ImageOptim for Mac, the app implements almost similar features, including lossless compression techniques and optional removal of metadata. Trimage is also free and open source, and is available for various Linux distributions. If you’re sharing photos from your computer to any social media platform, you can easily remove EXIF metadata from them using the above tools, before sharing them online. But when you’re using smartphones, usually the photos are directly shared from Camera Roll (or Photo Gallery for Android and other platforms). There are some apps available on the App Store, which enable you to remove EXIF data from original photos, without maintaining a separate version with the EXIF data intact. Now, some users may want to retain EXIF information in their photos (for example, to organize photos based on Geotagging), but at the same time, not willing to share EXIF information. In such cases, specific apps are required that preserve the metadata on your device, but remove the information while sharing them online or with other apps. PixlMet is a free app available on the App Store, which allows you to browse photos from Camera Roll and remove EXIF data from them. The following steps will guide you to remove EXIF data from photos on iOS, before sharing them online. Download and install PixlMet from the App Store. Launch the app and open the particular photo that you want to share without metadata. Tap on the Share button on the bottom left corner. Select “Share Photo Without Metadata” and select the appropriate sharing option. Your photo will be shared to the desired platform without its EXIF metadata. On your device though, the metadata for that particular photo would still be retained. If you want to keep a copy of the photo without the EXIF data, on your iOS device, you can do so by choosing the Save Image option in the Share Menu after selecting “Share Photo Without Metadata” option. Additionally, if you want to edit the EXIF information (for example, Geo Location) in photos without completely removing them, you may upgrade to the Premium version of PixlMet via in-app purchase. If you want to share photos directly from Camera Roll, without the EXIF metadata, you can try another app called ViewExif. ViewExif provides a Share Extension, which is accessible from Camera Roll, that may be used to view metadata information in photos. You may then share the photo with or without the embedded metadata, by selecting the appropriate option from the Share Menu. Photo Exif Editor is a decent Android app that helps you to view, edit and remove EXIF metadata from photos. Once installed, it is accessible from the Share menu, so you can also edit photos that have initially been opened in other apps. The following steps will guide you to remove EXIF metadata from photos on Android. Download and install Photo Exif Editor from Google Play Store. Launch the app and browse for the photo, which you want to remove metadata from. The app will display all the embedded metadata. Now, tap on the Exif icon in the top right corner. Select the data that you want to remove; then tap on the Save icon on the top right position. The selected EXIF data will be removed from the particular photo. Note: Photo Exif Editor overwrites the modified EXIF data in the original photo. So, if you want to remove EXIF data while sharing a photo, without erasing the same from your device, it is recommended that you make a copy of the original photo and then edit the copy. Later, you may share the copy without the metadata on other platforms, while the original one still contains all the EXIF information. Do you know any other apps that can remove EXIF information? Let us know in the comments below.